I hope you have all enjoyed your holidays. Mine was fairly calm and quiet; but lots of fun, nevertheless. It was really strange without the hubs; but we are anxiously awaiting his return in the next week or so and will be happy to have him home for at least a few days before he has to leave again! OWH sets "Year Round Sentiments"
I decided that it would be a good set for the CASE study challenge. I really liked the simple layout. It was one that could be dressed up or kept really simple. I think I found a middle ground with my design...at least I hope I did. 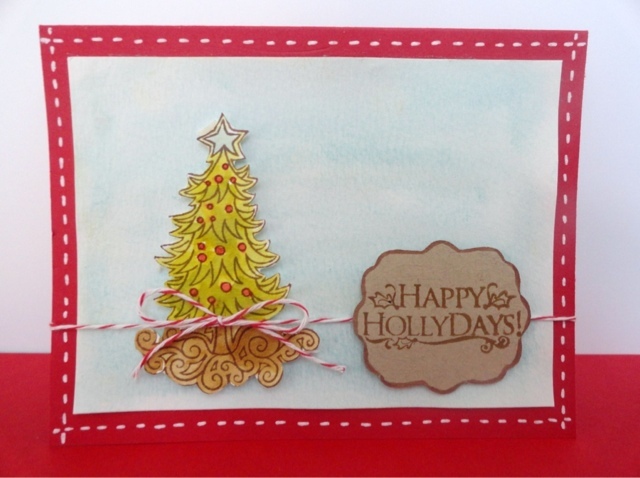 I have also been playing and experimenting with my Distress inks for this card I used Iced Spruce, Rusty Hinge, Walnut Stain to coordinate with my color palette of Dark Chocolate, Ocean Tide, Aqua Mist, and Melon Berry from PTI. I also used some Soft Sky ink from SU. 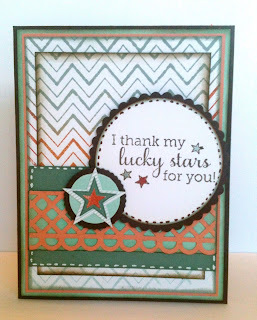 I used the three colors to stamp on the new Hero Arts Zig Zag background stamp. I messed up one piece and then messed up the second piece...and then somehow they ended up combined and layered together in the two pieces that are on the card. Well, I decided to do something a bit different with the rest of the cards that I want to share with all of you for the rest of the 25 days of Christmas series that I've been doing. 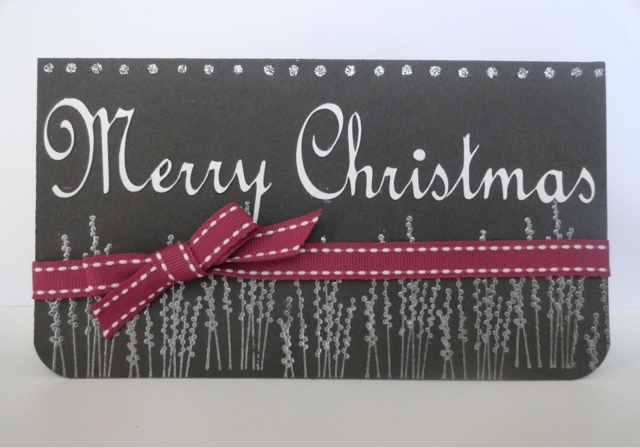 With the big holiday right around the corner, I am swamped with shopping and wrapping and family things as are so many of you I am sure. 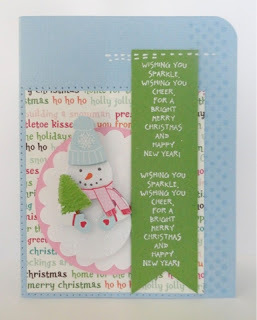 So, I am going to post the remainder of the cards here in this post. The pictures below are for Days 19-24. Now, you'll notice that Day 25 is missing. I did. A day 25. I really really did; but then I mailed it before I photographed it!! D'uh! So, you'll just have to take my word for it. So, that is going to wrap up my blogging for this year. 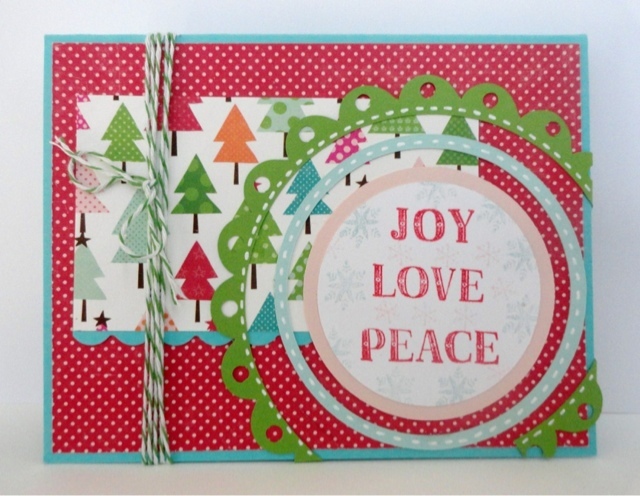 I am going to enjoy the rest of my holiday season and I hope you all do the same! Merry Christmas to all of you and I'll see you again the first week or so in January! 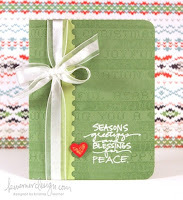 Please be sure to visit Kristina's website one more time where you can see all the inspiration for these final cards. Today's card is one that I really like; but I can't exactly explain why I like it so much. It's definitely not a traditional Christmas card; but I was really pleased with how elegant it turned out. I thought the silver embossing on the smoky shadow was a big success and I will definitely remember to do again. 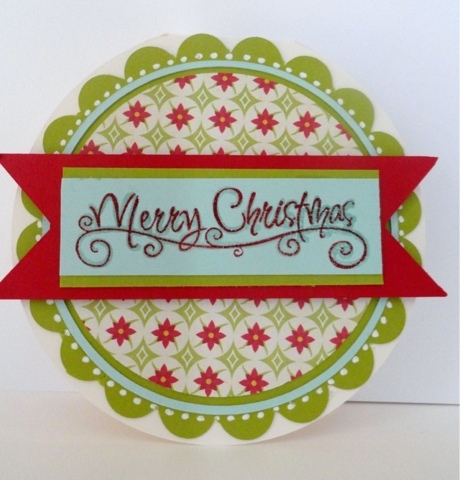 For her Merry Christmas card, Kristina very generously offered an SVG file for 99cents. 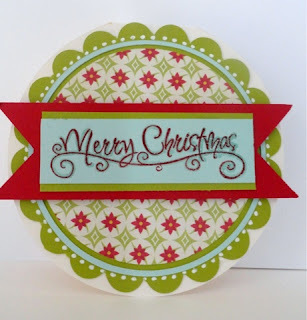 I downloaded the file; but wasn't able to use it because I just couldn't get it to cut right with my Cricut. So, I made a different one instead and it was still a bit difficult; but I finally got it to work. Yay me!!! I tied some retired Pomegranate ribbon from S.U.around the center. I was going to use red ribbon again, like I did yesterday; but I decide that I really rather liked the purplish hue with the dark grey instead. I wanted a little more sparkle to the card, so I finished it off by adding a little row of silver stickle dots along the top. So, there it is. Simple, and easy. 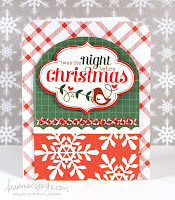 Please be sure to visit Kristina's original post for the card to see Thanks for visiting again with me today; and I'll see y'all tomorrow! Anyhow, I'm sure you aren't here to listen to me babble on about the weather, so let's talk about today's card, shall we?! 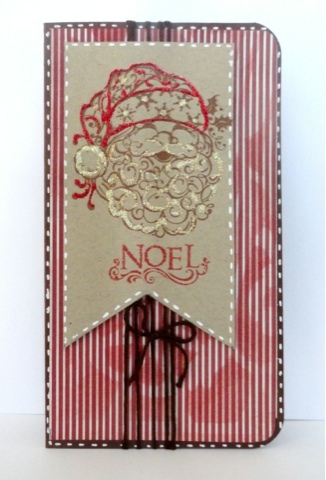 As with many of the cards this season, this is another example of keeping it simple. 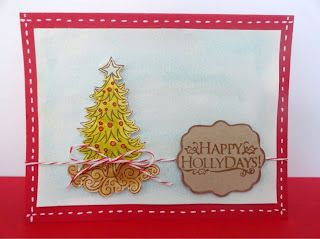 For her card, Kristina used a couple of different stamps and elements from what I needed to use. 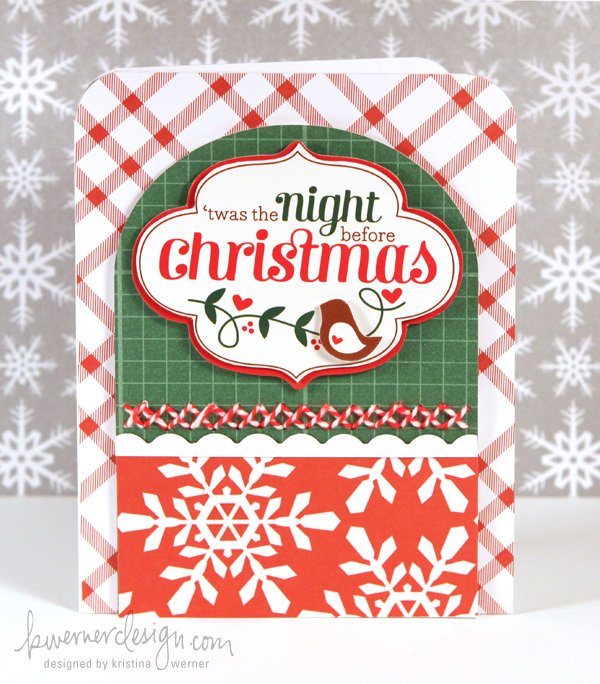 I chose the Plaid Background stamp from Hero Arts which I embossed with versa mark and clear embossing powder on New Leaf card stock. 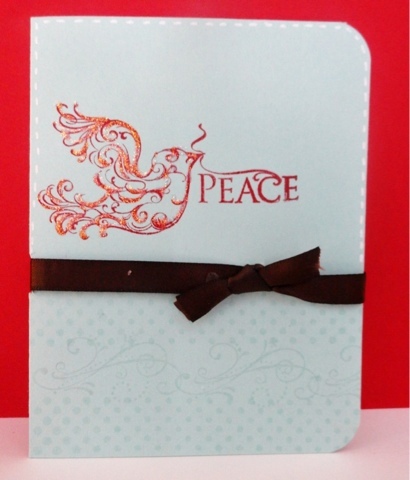 I added a small strip of light blue card stock that I had punched with the threading waters edge punch. I did a little more embossing with the sentiment using some white powder. I added the stitched ribbon from PTI and finished the card. Thanks so much for visiting with me again today. Enjoy your afternoon and I'll be back tomorrow!